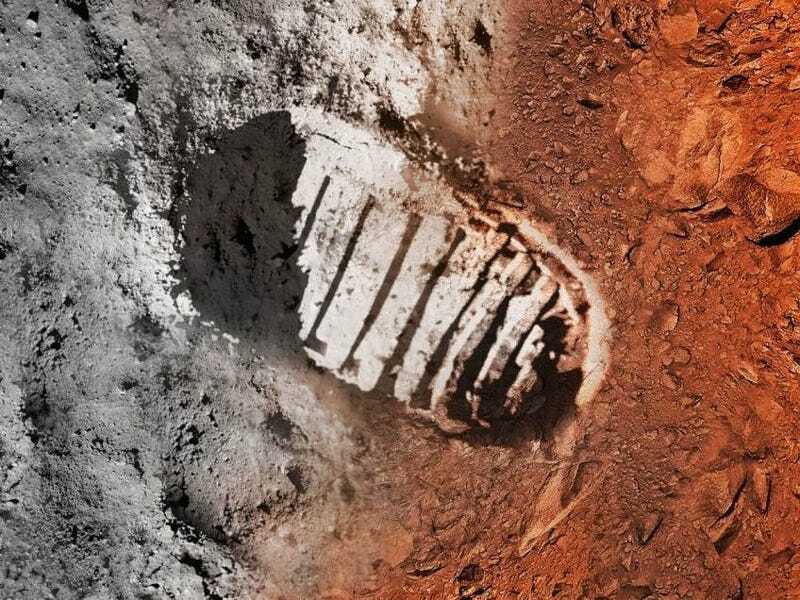 NASA's mission to Mars panel at Comic-Con today was jam packed with space-loving geeks. Retired astronaut and living legend Buzz Aldrin left everyone in awe, while the rest of the panel gushed enthusiastically about the "Next Giant Leap" to Mars. At least, so I hear. I didn't actually make it in the door. I was one of the thousand heartbroken space enthusiasts left in the hallway, grumbling and sullenly kicking the wall about how I loved science before it was cool. I consoled myself by declaring that real fun happened in the post-panel media junket, when every panelist except Aldrin engaged in space-themed storytime. But, I admit I'm disappointed I didn't get to photograph Buzz Aldrin in a Mars shirt on a panel with Bobak Ferdowsi in a Moon shirt in a cross-generational sartorial salute to exploration. NASA's first major appearance at Comic Con is in support of "Next Giant Leap," the set of missions dedicated to human exploration of the solar system. This includes enthusiastic support of Orion and the Space Launch System under development to propel human explorers to join our charismatic rovers on Mars. Which is cool, but how did a science panel compete with all the high-draw celebrity events to pack a room to capacity during a popular culture convention? After Aldrin sauntered into the distance to do whatever it is that Apollo 11 astronauts do at Comic Con, the rest of our cast of characters tackled the question from a variety of perspectives. Current astronaut Mike Fincke, Planetary Sciences Division Director Jim Green, and JPL systems engineer/hairstyle trendsetter Bobak Ferdowsi are gleefully excited over NASA's continued exploration of our solar system, and find it eminently reasonable that scifi geeks are, too. Space is where science fiction and science fact intersect. It's a frequently-referenced concept that so many scientists are inspired by fiction and that so much fiction is the product of exploring the evolution of our technology into the future. Fincke takes that to its logical conclusion, that being an astronaut is one of the places where he gets to transform science fiction into reality. As Curiosity's driver Ferdowsi quips, going to work is stepping into the future. In some ways, it isn't surprising that their room hit capacity. Not only is space just flat-out cool, NASA is an organization that elicits giddy enthusiasm. Even actual rocket scientists are not immune: Ferdowsi confided that despite not being alive for the Apollo 11 moon landing, he had to carefully conceal fangirlish squealing to be on a panel with the one and only Buzz Aldrin. Along with literally exploring new worlds, NASA also takes an active role in generating science-based fiction. They frequently partner with entertainment producers to help bring authenticity and accuracy to movies and television. While Gravity took some heat for getting the details wrong, actual astronaut and person who has been in space for reals so knows what he's talking about Fincke appreciated how well the movie captured the look and feeling of being in space. NASA's contributions can also be more subtle: Halle Barry interviewed countless women in science and engineering working at Jet Propulsion Laboratories while preparing for Extant. No one scene can be traced back to that tour, yet her choices are a reflection of the unique people who choose to work with spacecraft, satellites, and robotic explorers on distant planets. Reason #19 why I'm a scientist, not an engineer: less chance of my coworkers suddenly dying during a Star Trek episode. It's a constant cycle: science inspires fiction, which inspires all new science. Along with being cultural icon of the current generation of rocket scientists, Ferdowsi is an unabashed Star Trek geek. His biggest challenge for this weekend? Deciding if he'll be cosplaying in science blues or engineering reds. He is an engineer ("They're my people! "), but the abrupt death endemic to redshirts isn't appealing. As for next year? They'll be back. As for getting them into a bigger space to accomodate even more space junkies? Ferdowsi mused, "If NASA filled Hall H... we'd feel pretty good." Maybe I'm biased, but filling 6,500 seats sounds downright plausible.